PURPOSE: Manufacturers of uncoupled cycling cranks claim that their use will increase economy of motion and gross efficiency. Purportedly, this occurs by altering the muscle-recruitment patterns contributing to the resistive forces occurring during the recovery phase of the pedal stroke. Uncoupled cranks use an independent-clutch design by which each leg cycles independently of the other (ie, the cranks are not fixed together). 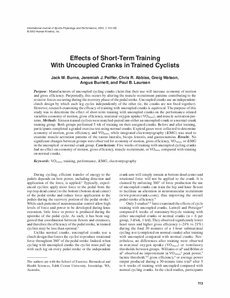 However, research examining the efficacy of training with uncoupled cranks is equivocal. The purpose of this study was to determine the effect of short-term training with uncoupled cranks on the performance-related variables economy of motion, gross efficiency, maximal oxygen uptake (VO2max), and muscle-activation patterns. METHODS: Sixteen trained cyclists were matched-paired into either an uncoupled-crank or a normal-crank training group. Both groups performed 5 wk of training on their assigned cranks. Before and after training, participants completed a graded exercise test using normal cranks. Expired gases were collected to determine economy of motion, gross efficiency, and VO2max, while integrated electromyography (iEMG) was used to examine muscle-activation patterns of the vastus lateralis, biceps femoris, and gastrocnemius. RESULTS: No significant changes between groups were observed for economy of motion, gross efficiency, VO2max, or iEMG in the uncoupled- or normal-crank group. CONCLUSIONS: Five weeks of training with uncoupled cycling cranks had no effect on economy of motion, gross efficiency, muscle recruitment, or VO2max compared with training on normal cranks.